Back in the summer, I was lucky enough to get my hands on some early builds of Stage3D for mobile. I built some simple examples, including basic geometric shapes and simple 3D bubble charts inside of mobile Flex/AIR applications. I have been asked numerous times for the source code, and I’ve finally given in, and am sharing some source code. I am not posting the full mobile application source code, since Stage3D for mobile is not yet available. However, I have ported the 3D bubble chart example to run in a Flex application targeting the desktop (Flash Player 11). The bubble chart example extends the concepts explored in the basic geometric shapes example. Before you say “shoot, he didn’t give us the mobile code”, let me explain… When I ported the code from the mobile project to the desktop Flex project, all I changed was code specific to the mobile Flex framework. I changed <s:ViewNavigatorapplication> to <s:Application> and the corresponding architecture changes that were required, and I changed the list item renderers to Spark item renderers based on <s:Group> instead of mobile item renderers. In the mobile item renderers, all my drawing logic was done using the ActionScript drawing API. For simplicity in the port, I just used <s:Rect> to add the colored regions in the desktop variant. That is all I changed! The source code was intended to be exploratory at best… I was simply experimenting with hardware accelerated content, and how it can be used within your applications. There is one big “gotcha” that you will have to watch out for if you want Stage3D content within a Flex application… Stage3D content shows up behind Flex content on the display list. By default, Flex apps have a background color, and they will hide the Stage3D content. If you want to display any Stage3D content within a Flex application (regardless of web, desktop AIR, or mobile), you must set the background alpha of the Flex application to zero (0). Otherwise you will pull out some hair trying to figure out why it doesn’t show up. You want fast & responsive audio for your mobile applications. This is especially the case for multimedia intensive and/or gaming applications. HTML5 audio is not *yet* ready for prime-time. There are some great libraries like SoundManager, which can help you try to use HTML5 audio with a failover to Flash, but you are still limited without polyphony or concurrency. In desktop browsers, Flash fixes these issues, and Flash is still vastly superior to HTML5 for audio programming. If you are building mobile applications, you can have great audio capabilities by developing apps with AIR. However, what if you aren’t using AIR? In native applications, you can access the underlying audio APIs and have complete control. 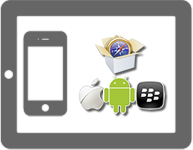 If you are developing mobile applications with PhoneGap, you can use the Media class, which works great. If you want polyphony, then you will have to do some work managing audio files for yourself, which can get tricky. You can also write native plugins that integrate with the audio APIs for the native operating systems, which is what i will be covering in this post. Concurrency in audio programming refers to the ability to play multiple audio resources simultaneously. HTML5 in most mobile devices does not support this – not in iOS, not in Android. In fact, HTML5 Audio does not work *at all* in Android 2.x and earlier. Native APIs do support this, and so does PhoneGap’s Media class, which is based on Android MediaPlayer and iOS AVAudioPlayer. Producing many sounds simultaneously; many-voiced. Low latency refers to “human-unnoticeable delays between an input being processed and the corresponding output providing real time characteristics” according to wikipedia. In this case, I refer to low latency audio, meaning that there is an imperceptible delay between when a sound is triggered, and when it actually plays. This means that sounds will play when expected, not after a wait. This means a bouncing ball sound should be heard as you see the ball bouncing on the screen. Not after it has already bounced. In HTML5, you can auto-load a sound so that it is ready when you need it, but don’t expect to play more than one at a time. With the PhoneGap Media class, the audio file isn’t actually requested until you invoke “play”. This occurs inside “startPlaying” on Android, and “play” on iOS. What I wanted was a way to preload the audio so that it is immediately ready for use at the time it is needed. I created PhoneGap native plugins for Android and iOS that allow you to preload audio, and playback that audio quickly, with a very simple to use API. I’ll get into details how this works further in the post, but you can get a pretty good idea of what I mean by viewing the following two videos. The first is a basic “Drum Machine”. You just tap the pads to play an audio sample. The second is a simple user interface that allows you to layer lots of complex audio, mimicking scenarios that may occur within a video gaming context. Assets used in this example from freesound.org. See README for specific links & attribution. Side Note: I have also noticed that touch events are slightly slower to be recognized on Android devices than iOS. My assumption is that this is related to specific device capabilities – this is more noticeable on the Amazon Kindle Fire than the Motorola Atrix. The delay does not appear to be a delay in the actual audio playback. You can learn more about getting started with native plugins on the PhoneGap wiki. Next, let’s examine some intricacies of the plugin… One thing to keep in mind is that I do not have callbacks to the phonegap app once a media asset is loaded. If you need “loaded” callbacks, you will need to add those yourself. The preloadFX function loads an audio file into memory. These are lower-level audio methods and have minimal overhead. These assets should be short (less than 5 seconds). These assets are fully concurrent and polyphonic. On Android, assets that are loaded using preloadFX are managed/played using the Android SoundPool class. Sound files longer than 5 seconds may have errors including (not playing, clipped content, not looping) – all will fail silently on the device (debug output will be visible if connected to debugger). On iOS, assets that are loaded using preloadFX are managed/played using System Sound Services from the AudioToolbox framework. Audio loaded using this function is played using AudioServicesPlaySystemSound. These assets should be short, and are not intended to be looped or stopped. The preloadAudio function loads an audio file into memory. These have more overhead than assets laoded via preloadFX, and can be looped/stopped. By default, there is a single “voice” – only one instance that will be stopped & restarted when you hit play. If there are multiple voices (number greater than 0), it will cycle through voices to play overlapping audio. You must specify multiple voices to have polyphonic audio – keep in mind, this takes up more device resources. On Android, assets that are loaded using preloadAudio are managed/played using the Android MediaPlayer. On iOS, assets that are loaded using preloadAudio are managed/played using AVAudioPlayer. Plays an audio asset. You only need to pass the audio ID, and the native plugin will determine the type of asset and play it. Loops an audio asset infinitely. On iOS, this only works for assets loaded via preloadAudio. This works for all asset types for Android, however it is recommended to keep usage consistent between platforms. Stops an audio file. On iOS, this only works for assets loaded via preloadAudio. This works for all asset types for Android, however it is recommended to keep usage consistent between platforms. Unloads an audio file from memory. DO NOT FORGET THIS! Otherwise, you will cause memory leaks. Do you want to learn more about the future of Flex? Do you want to learn more about the Flex transition to the Apache Software Foundation? How can you contribute and help make Flex thrive? Do you have questions that you would like to voice to Adobe? As promised, Adobe is kicking off The Flex User Group Tour to discuss recent events surrounding Flex and the Flash Platform. These meetings are intended to help you understand the changes happening with Flex and Flash, the impact to related tools, as well as to educate about the process & transition to Apache. You can learn more about the user group tour and get an up-to-date listing of dates & cities from the Flex Team blog – be sure to check back periodically for updates. Initial cities include New York, Boston, Denver, Seattle, Los Angeles, Sand Diego, and Dallas. Expect more cities & countries to be announced at a later date. We hope to see you at one of the upcoming events. I’m scheduled to speak at the Dallas event in April, and I hop to see you there! This is all made possible by the UIWindow and UIScreen APIs in iOS. Even better, on the iPad 2 and iPhone 4Gs, this can be done wirelessly using Airplay with an Apple TV device. On other iOS devices, you can have a second screen using a VGA output. One of the benefits of using a cross platform solution like PhoneGap or Flex/Air is that you can build apps with an easier to use/more familiar paradigm. However, cross platform runtimes don’t always offer access to every API feature that native development enables. Out of the box, PhoneGap apps are confined to a single screen. You can use screen mirroring to mirror content on an external screen, but you can’t have a second screen experience. It’s a good thing you can write native plugins/extensions to enable native functionality within your applications. Let’s first consider a simple Fleet Manager application which allows you monitor vehicles in a mobile app. This is a similar concept which I’ve used in previous examples. The basic functionality allows you to see information on the tablet regarding your fleet. What if this app connected to a larger screen and was able to display information about your vehicles for everyone to see? Watch the video below to see this in real life. This application example is powered by Google Maps, and all of the data is randomly generated on the client. Let’s next consider a mobile law enforcement application application which gives you details to aid in investigations and apprehension of criminals. Let’s pretend that you are a detective who is searching for a fugitive, and you walk into a crowded bar near the last known location of that fugitive. You connect to the bar’s Apple TV on their big screen TV, pull up images and videos of the suspect, then say “Have you seen this person?”. This could be incredibly powerful. Check out the video below to see a prototype in real life. This law enforcement demo scenario is a basic application powered by the FBI’s most wanted RSS data feeds. The ExternalScreen plugin creates a UIWebView for the the external screen, and exposes methods for interacting with the UIWebView. Note: This is just a normal UIWebView, it does not have support for all PhoneGap libraries… just a standard HTML container. The header file shows the method signatures for the native functionality. The corresponding PGExternalScreen.m contains all of the actual code to make it all work. Note: If you are using ARC (Automatic Reference Counting), you will need to remove the retain/release calls in PGExternalScreen.m. The PGExternalScreen.js file defines the native methods that are exposed through PhoneGap. You invoke the function, and can add success/fail callback function references. Be sure to read the README for additional setup information. Andrew is a Developer Advocate for IBM. Disclaimer: This blog contains my personal thoughts and not those of my employer.